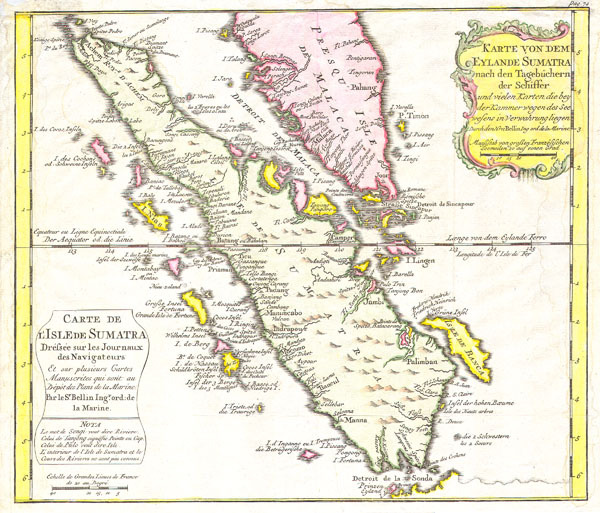 Karte von Dem Eylande Sumatra nach den Tagebuchern der Schiffer / Carte de l’Isle de Sumatra Drefsee sur les Journaux des Navigatuers. This is a beautiful map of the island of Sumatra and the southern tip of the Malaysian Peninsula was produced by the French Cartographer Jacques-Nicolas Bellin in 1852. Depicts the entirety of Sumatra as well as much of modern day Malaysia. Includes the Straights of Singapore (Sincapour). Two decorative title cartouches decorate the map, one in French and one in German. This, the German edition, of is excpetionally rare. Fine or perfect condition. Original platemark visible. Blank on verso.